(CNSNews.com) - The merchandise trade deficit that the United States ran with China in 2015 hit a record high of $365,694,000,000, according to data released Friday by the U.S. Census Bureau and the Bureau of Economic Analysis. 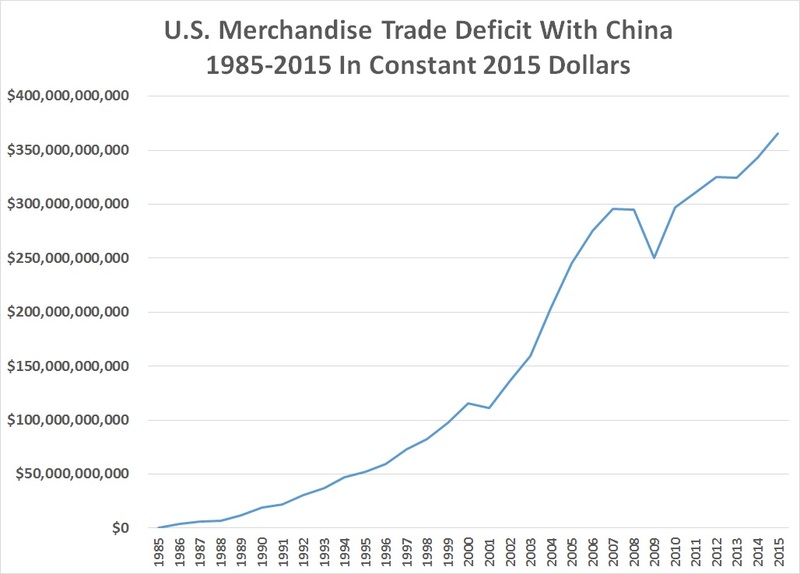 The $22,615,700,000 increase in the merchandise trade deficit the U.S. ran with China last year was a 6.6-percent jump from the $343,078,800,000 merchandise trade deficit the U.S. ran with China in 2014. The merchandise trade balance deals only with the goods that are imported and exported between the two countries. It does not include the export and import of services. In recent years, according to the Bureau of Economic Analysis, the U.S. has run a surplus in its exchange of services with China, while running a much larger deficit in its exchange of goods. In 2014, for example, the U.S. ran a $28.077 billion surplus in services traded with China, according to BEA. That caused the overall 2014 U.S. goods-and-services trade deficit with China—which was $315.116 billion—to be less than the 2014 merchandise trade deficit of $343,078,800,000. The BEA is scheduled to release the 2015 balance of trade in services with China (and other countries) on March 4. The Census Bureau has published U.S.-China export and import numbers on goods going back to 1985. During the past thirty years, the annual value of U.S.-China trade has risen dramatically. So, too, has the gap between the value of the Chinese goods imported into the U.S. and the U.S. goods exported to China. In 1985, according to the Census Bureau, the U.S. exported $3.8557 billion in goods to China and imported 3.8617 billion back—running a deficit of only $6,000,000. By 1995, the U.S. was exporting $11.7537 billion from China while importing $45.5432 billion—running a deficit of $33.7895. By 2005, the U.S. was exporting $41.1920 billion to China while importing 243.4701 billion from China—running a deficit of $202.2781 billion. In 2015, the Census Bureau reported Friday, the U.S. exported $116.1863 in goods to China while importing $481.8808 billion—running a merchandise trade deficit with China of $365.6945 billion. 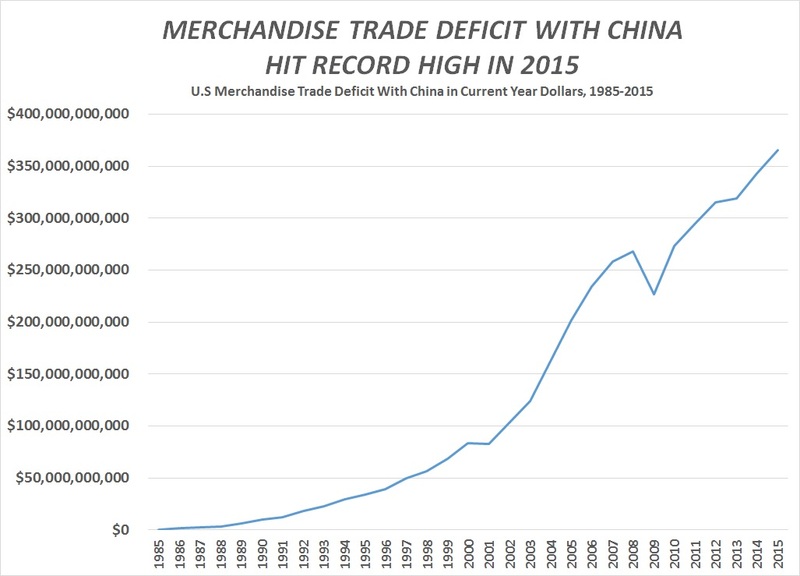 Even when the historical annual merchandise trade deficits that the U.S. has run with China are adjusted for inflation and put in constant 2015 dollars using the Bureau of Labor Statistics inflation calculator, the $365.6945 billion merchandise trade deficit the U.S. ran with China last year is still the largest recorded by the Census Bureau. “For the past several years, the U.S. trade deficit with China has been significantly larger than that with any other U.S. trading partner and several trading groups,” said a Congressional Research Service report (“China-U.S. Trade Issues") published in December. As calculated by the Census Bureau, the U.S. ran an overall trade deficit in goods in 2015 of $736.1719 billion. The largest contributor to that deficit was China and its $365,694,500,000 bilateral deficit with the U.S. The second largest contributor was Germany, with whom the U.S. ran a $74,192,600,000 merchandise trade deficit. The third largest contributor was Japan, with whom the U.S. ran a $68,647,900,000 merchandise trade deficit. The fourth was Mexico, with whom the U.S. ran a $58,363,700,000 merchandise trade deficit. And the fifth was Vietnam, with whom the U.S. ran a $30,921,400,000.